FLASH BACK: Rescuers at Mowasi/Pepper Creek where 11 miners were buried alive in May, 2015. 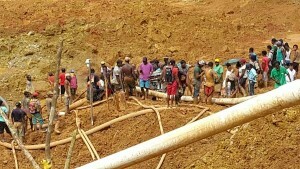 Dennison told the Government Information Agency (GINA) in an invited comment on Thursday, that miners should, “exercise extreme caution in their work” in rainy conditions. Last year, seven mining related deaths were recorded. Already, the GGMC has developed a Mines Safety Plan of Action which includes strategies for occupational health and safety measures. The government will also be collaborating with the Guyana Mining School to ensure that miners receive training in safe mining practices.